With “Mad Max: Fury Road” currently blowing audiences hair back nationwide, I wanted to revisit another post-apocalyptic action film, very much inspired by George Millers previous Mad Max films, “Bounty Killer” (2013). You can read two previous reviews of the film itself here and here, but for this issue I sat down with cinematographer David Conley to talk about his contribution to the film as well as upcoming projects of his own. LA: Bounty Killer is packed with action – from the fight sequences to car & motorcycle chases. What were some of the camera toys & tools that made it possible to get the coverage you and Henry Saine needed? DC: Bounty Killer is definitely packed with a ton of action and shooting the movie was no different. Henry and I decided the movie needed a very active camera. 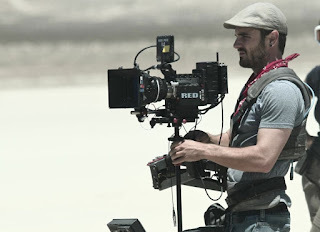 I operated a Steadicam Flyer on nearly every scene in the film. On top of that we used a Jimmy Jib, which can go around 40 feet high, but my favorite toy we had was the Ultimate Arm. It is a black Mercedes SUV with a crane arm on the top. The car takes three operators: The driver, the crane arm operator, and the camera operator who calls all of the shots. In the right hands It is capable of capturing some of the most dynamic shots you can think of. Luckily for me, George Peters, who is one of the founders and an incredibly experienced operator with a long list of major credits, came out to operate the camera for me. It was a great pleasure directing him and watching him work. If you haven’t seen Bounty Killer, you most likely saw some of the Ultimate Arm’s handiwork on “Skyfall,” which was the movie they worked on just before.